All you need is a general comfort about boats and a desire to learn to drive on to attend the new Annapolis Power Boat School. Evan, Hannah and I set out to Annapolis for different reasons but with the same goals. Evan, and age 17 is a lobsterman from Booth Bay Harbor Maine and wants to learn to drive a power boat safely for the future of his business. Hanna, at 20 has a goal of getting enough boat handling experience under her belt to apply for a job on a yacht, and in that way see the world. I grew up on fishing boats and never really noticed that somehow I missed learning the navigation and boat handling part. I would like to be able to buy or charter a powerboat for cruising and fishing. On Sunday we checked in to Chez Amis as our starting point for powerboat school. Mickey, the owner warmly welcomed us to her charming three room B&B located only a block from the dock in the historic district. As the buttery afternoon sun set over beautiful Annapolis harbor, we ventured out to explore. We found dinner overlooking the harbor watching boats and people enjoy the evening. Mickey’s native ebulience combined with her specialty baked breakfast were the way we started our adventure. By 8:30 Monday morning, we were at the Annapolis Powerboat School headquarters, a classic building under aged shade trees on Spa Creek. After a brief description of the week’s itinerary, we met the rest of our class which made us a group of nine going out in two 30′ boats. Our instructors filled the coolers on each boat with a dozen kinds of drinks, snacks and box lunches. 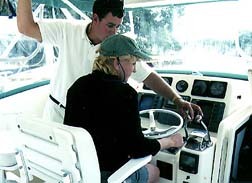 A quick class on how to work the head, how to check the engine and were were good to go for our week on the Chesapeake. My personal anxiety was easily displaced by the calm demeanor of our instructor Shawn as one at a time we were introduced to driving “twin screws”. The first exercise we each performed was to gently approach a mooring ball, and then back off. Lunch was the reward for each of us after docking, and finally tying up. The afternoon was filled with taking turns at the helm, discovering the power of our engines as we headed under the bridge and out onto the open bay. In the evening we practiced docking in front of the Inn at Osprey Point, our first stop for dinner and the night. Maybe it was just the tired and hungry feeling you get from a day on the water, but I would say that the food was the best I had ever had! So was the sleep! In the morning the water was flat calm. We all eagerly munched down a continental breakfast and then headed down to the dock with our instructors for day two of our power cruising course. Over the next four days we practiced these skills, adding chart reading, course plotting, anchorage and tying knots. We stayed at the Imperial Hotel in Chestertown, the Robert Morris Inn, and the Harrington Point Hotel before heading back to Annapolis having covered a total of 140 miles by boat and having a new understanding of travel by water. We felt capable and in control at the helm upon our return, needing only practice to enjoy safe boat handling for the rest of our lives.